Bombed out buildings in Aden, Yemen. The United Nations Special Envoy for Yemen, Ismail Ould Cheikh Ahmed, announced today a plan for the resumption of a comprehensive cessation of hostilities in the war-torn Gulf nation. 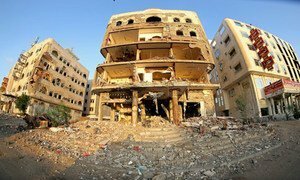 According to his Office, the Special Envoy has received assurances from all Yemeni parties of their recommitment to the Terms and Conditions of the Cessation of Hostilities of 10 April 2016, which will re-enter into force at 23:59 Yemen time on 19 October 2016, for an initial period of 72 hours, subject to renewal. Mr. Ould Cheikh Ahmed welcomed the restoration of the cessation of hostilities, “which will spare the Yemeni people further bloodshed and will allow for the expanded delivery of humanitarian assistance,” and he called on all Yemeni parties, the region and the international community to encourage full respect for the cessation of hostilities and to ensure that it leads to a permanent and lasting end to the conflict. The Special Envoy went on to call for the immediate reactivation of the De-escalation and Coordination Committee (DCC) and the deployment of its members to Dhahran Al Janoub as agreed during the Kuwait talks. Finally, Mr. Ould Cheikh Ahmed reminded all Yemeni parties that the terms of cessation of hostilities include an obligation to allow free and unhindered access for humanitarian supplies and personnel to all parts of Yemen, in addition to a full and comprehensive halt to military activities of any kind. Yemen has been engulfed in violence for several years now – a confrontation between the country's Houthis (Ansar Allah) and the Government of Yemen in early 2014 led to a Houthi advance on the capital, and an ensuing conflict which has involved support from outside parties. The UN has been heavily involved in efforts to resolve the crisis. While peace talks between a Yemeni Government delegation and a delegation of the General People's Congress and Ansar Allah continued, serious violations have occurred in Marib, al Jawf, Taiz and in the border areas with Saudi Arabia. Those UN-facilitated talks ended on 6 August. Outraged by Saturday’s bombing of a funeral in Yemen, top United Nations officials are strengthening their calls for the establishment of an independent body to probe alleged violations of international humanitarian and human rights laws in the war-ravaged country.